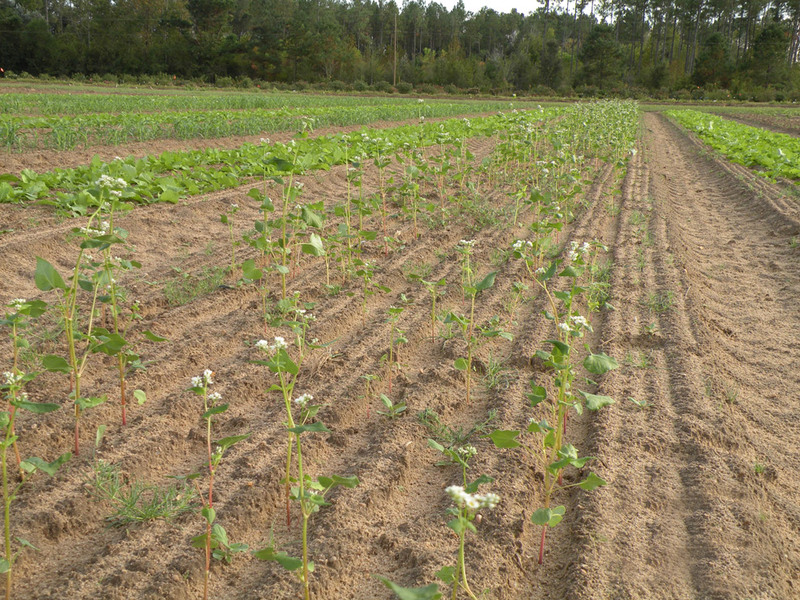 A central row of Buckwheat being used as a trap crop on a large scale. First, a basic definition. A Trap Plant is used to attract insect pests away from a desired plant. When used on a large, industrial scale, we use the term Trap Crop. Trap Crops are just a larger planting of Trap Plants which protect the main crop from insect predation. Now let’s take a closer look at each of these advantages. This is fairly straightforward. If you don’t have pests on the fruit or vegetable you are trying to harvest, then you are not going to use a pesticide. I am all for not using any chemicals on my food, whether they be toxic mainstream pesticides or “safe” organic pesticides. If I don’t have to put something on a plant that wouldn’t be there on its own, then that is ideal. If you are a backyard grower who is somewhat committed to an organic garden, then avoiding a pest outbreak in the first place will reduce the temptation of using potentially harmful chemicals on your plants. One of many problems with the use of pesticides is that they indiscriminately kill insects, the good along with the bad. By using techniques that reduce or eliminate pesticides, we are preserving the population of beneficial insects. Predatory and parasitic beneficial insects are vastly outnumbered by their prey. Just think of the African savannahs; they are full of wildebeests, zebras, gazelles, and other grazing animals, but there are relatively few lions or cheetahs in comparison. There needs to be a healthy population of prey for the predators to be sustained in the environment. A garden system that has absolutely no pests will certainly not have the beneficial insects which we want. Why would they be there? There is no food for them. But we don’t want our food crops to be hosting the pests either. By providing plants that the pest insects can eat, we are in fact maintaining a food source for the beneficial insects that use the pest insects for food. Since the predators are present in the garden, the pests will have a significantly harder time inflicting damage. Proper use of trap plants involves monitoring the life cycle of the pests. When the trap plant becomes covered in pest eggs or pest caterpillars, it is time for us to intervene. Maybe we cut down the trap plants and bury them in the hottest part of the compost bin. Maybe we put the cut plants covered in pests in the burn pile. Maybe we toss the branches covered in caterpillars in the chicken pen. By intervening at the proper time, we are allowing the pest to expend a large amount of energy on growth or reproduction or both, but not allowing that pest to capitalize on its investment. If almost every time an adult pest lays eggs those eggs never make it to adult stage that can itself reproduce, how many of those pests will continue to be in your garden? Not too many. By allowing some pests to survive, but away from our food crops, we will encourage more predatory and parasitic beneficial insects into our gardens. Life will never thrive in a vacuum, and in nature a vacuum never lasts. If we try to sterilize our gardens by chemically destroying all pests, we are creating a vacuum of our garden. Without constant vigilance of our garden vacuum, our garden will be overrun the moment we are not looking. Maybe it is a few days of having to work late and not being able to get into the garden or maybe it is a vacation for a long weekend. When we return, we notice that our food crops are covered in caterpillars or, worse yet, we see skeletons of our former plants with no leaves and dozens of fat, happy caterpillars munching on the few remaining bits of green. It has happened to me, for sure. However, by having trap plants and allowing some pests to remain as food for the beneficial insects, we are allowing for the natural increase in biodiversity that will develop in any environmental system. This is obviously the ultimate goal of trap plants, and it works. It takes observation and planning, but working with nature instead of constantly fighting it is considerably easier, less stressful, and more fun. It is also great for the environment and health of your garden. It is so successful, that many farmers are using this method on a large scale. Reducing crop loss in your own garden is just as effective. I’ll be expanding on this topic more in the next few days with examples of trap plants and ways to use them in your gardens. Stay tuned!